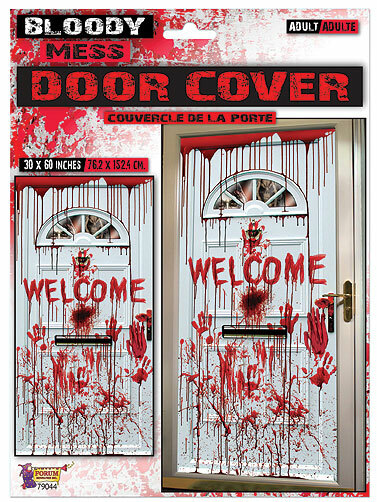 Bloody Mess Welcome Door Cover will deliver a bloody greeting to your Halloween party guests. Plastic door cover in white with the word "Welcome" and a bloody mess of splatters and bloody hand prints all around. Okay for outdoor displays. Will fit most doors and can be easily cut to fit. Hang with tape or similar adhesive. Bloody Mess Welcome Door Cover measures 30"W x 60"H.